Drowned Towns of Bell County, Texas. Texas has two varieties of ghost towns – those out in the middle of nowhere on dry land (assuming they exist at all) and those that lie beneath man-made lakes. Watery ghost towns are scarcer than their dusty counterparts, of course. Most lakes cover no ghost towns, some, just one former community. But one Central Texas lake drowned several communities. When the U.S. Army Corps of Engineers completed in 1954 the $13.6 million flood control dam on the Leon River in Bell County that would create Lake Belton, a string of four small communities – some already dead, some moribund – ended up submerged. To list them alphabetically, the first town was Allen, located about four miles south of the town of Moffat. It once boasted a few three-story buildings, stores, saloon, a blacksmith shop. For a time during the Civil War, a factory there manufactured hats used by the Confederate Army. A distillery produced whisky its owner distributed across the state by ox-drawn wagon. The next town lost to Lake Belton was Bland, founded in 1880 by Col. John Atkerson, who opened a general store near where Owl Creek flowed into the Leon. The colonel took in money from his customers in two ways. The first was the traditional exchange of coin and cash for dry goods, notions and hardware. The second was a standing poker game in the store’s back room in which shoppers, at least the men, often were relieved of the change they had left after buying what they needed. The card game developed such repute – disrepute might be a better word – that people started calling the town Pokersville. Fourteen years went by before residents decided that a name honoring a game of chance was not particularly dignified for a town with aspirations of growth. It must have been someone with a wry sense of humor who suggested that instead of Pokersville they name the place Bland. No matter its plain-sounding name, Bland still had 20 residents in 1949 (down from its peak of 63 in 1925) when contractors brought in heavy equipment and began moving earth in preparation for the placing of metal and the pouring of concrete. For years, the Bland post office had been run by John Trimmier, whose service as postmaster was a near national record. After he cancelled his last stamp, his daughter took over and operated the station until it closed. The next vanished town was Brookhaven. On Oak Branch near the Leon about 12 miles northwest of Belton, the community was first known as Post Oak Branch. However, in 1882 it was renamed for the town in Mississippi where a couple of its residents hailed from. By the turn of the century, Brookhaven had 75 residents and a Masonic hall, school, three churches, two stores, two drug stores, and a cotton gin. The post office closed in 1913, and by World War Two the town had only 50 or so residents. 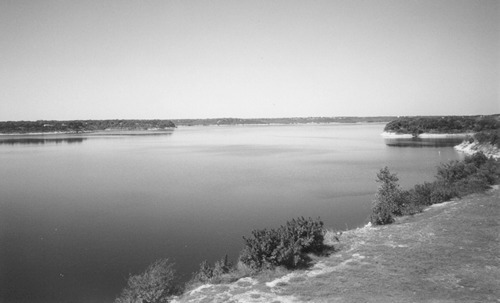 Part of it was erased when the Army acquired property for Fort Hood, and anything that was left was swallowed by the lake. Finally, there was Sparta, a little village near where Cow House Creek drained into the Leon. A long way from the site of its namesake in Greece, Sparta is believed to have started out with the more terrain-appropriate name of Cedar Grove. When that post office burned, early area settler Francis D. Smith (the postmaster) and Wash Walton applied for the more exotic name. The Post Office Department gave its approval in 1873. The Sparta post office closed in 1920, but in 1948, the town still had a couple of churches, two businesses and a school. But the lake did what the boll weevil and the Great Depression had not and killed the town. Following completion of the 100-foot tower that would serve as the reservoir’s water intake and overflow release system, the Temple newspaperwoman drove to the construction site for a look around.